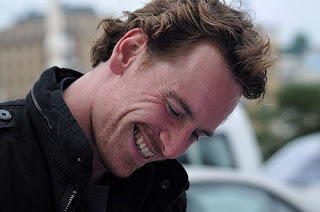 This week's Photo of the Week is of Michael smiling, which are his best photos. He has such a genuinely radiant smile that is contagious. This picture was taken back in September, but I just found it yesterday. Maybe I've seen it before, but I don't think so. I just love finding images that are 'new' to me. Over at Awards Daily, they have a 'Create your own FYC Ad' thread and lots of creative people have submitted their homemade FYC ads for their favorite films and performances. Now more than ever, the old adage of, 'If you want something done right, do it yourself' rings true this very moment. 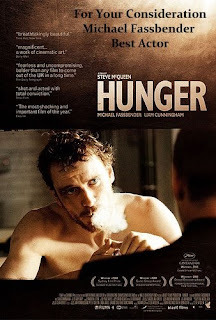 As there are no FYC ads for Michael Fassbender or Hunger, I whipped up a quick one and posted it at AD, and now here. You never know who will stumble upon these fan FYC ads. It's all in good creative fun, but the intentions behind all of them are very sincere. I may make another one in the coming weeks. I added a Guestbook link for FF on the sidebar. I figure it would be a nice thing to have for people who want to post a quick comment there. If you enjoy FF but don't feel inclined to post a comment here, just go to the guestbook and say 'hello'. Danke.